About Mel Gibson's movie: "The Passion of the Christ"
Do the actors resemble the actual historical characters? 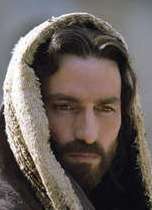 James Caviezel, who starred in The Thin Red Line, was cast as Yeshua of Nazareth (Jesus Christ). His was a difficult role. He was allegedly struck by lightning during the filming. He suffered hypothermia and a dislocated sholder. Two of the whip strokes missed his protective gear and hit his body with incredibly painful results. Monica Belluci plays Mary Magdalene. Maia Morgenstern plays Mary, the mother of Yeshua. The film was shot in Italy. Great efforts were made to replicate the language, clothing, architecture, decor, etc. of Judea in the first century CE. Early versions of the movie were extensively previewed by many religious groups before it was released to thousands of movie theatres across North America on 2004-FEB-25. It is worth noting that the name of the film is "The Passion of The Christ," not "The Passion of Christ." "Christ" is being referred to in its original meaning of "Messiah." It is not Yeshuah's (Jesus') last name, as many people believe. The "diaries of St. Anne Catherine Emmerich (1774-1824) as collected in the book, 'The Dolorous Passion of Our Lord Jesus Christ'." 2 She was an Augustinian nun who lived in Germany. Many information sources incorrectly state that she was the author of the book. In reality, it was Brentano, a famous German author and poet, who assembled descriptions of her visions into book form. It is available online. 3 One posting on a mailing list to which we subscribe wrote that when they read this book, they thought that they were reading Mel Gibson's screen play. The dialogue in the four gospels could probably fill less than a half-hour of film. A great deal of non-biblical material was added in order to flesh out the movie to its full length of 126 minutes. Whether this additional material was similar to the real events and dialog in first century CE Judea is a matter of debate. How closely do the actors resemble the historical characters? The actor who plays the role of Yeshua, Jim Caviezel, resembles the common perception of Jesus: a tall male with a pale face; Caucasian and not Middle Eastern in appearance. Yeshua probably looked very different -- with a broad peasant's face, dark olive skin, short curly hair and a prominent nose. His height would have been on the order of 5' 1"; he would have weighed about 110 pounds. Other actors look similarly pale and tall compared to the historical characters that they were playing. The movie has greatly departed from the historical reality, presumably in order to meet the public's perceptions. Rosalinda Celentano played the role of Satan in the movie. She appears as an androgynous being, both in the introductory scenes in the Garden of Gethsemane and during the scenes when Jesus is being flogged. Neither appearance is mentioned in the Bible. After receiving many queries from readers, Christianity Today magazine asked Mel Gibson why he had shown Satan in this manner, and what the significance of the ugly baby was. Gibson replied: "
"I believe the Devil is real, but I don't believe he shows up too often with horns and smoke and a forked tail. The devil is smarter than that. Evil is alluring, attractive. It looks almost normal, almost good?but not quite." "That's what I tried to do with the Devil in the film. The actor's face is symmetric, beautiful in a certain sense, but not completely. For example, we shaved her eyebrows. Then we shot her almost in slow motion so you don't see her blink?that's not normal. We dubbed in a man's voice in Gethsemane even though the actor is a woman ? That's what evil is about, taking something that's good and twisting it a little bit." "Again, it's evil distorting what's good. What is more tender and beautiful than a mother and a child? So the Devil takes that and distorts it just a little bit. Instead of a normal mother and child you have an androgynous figure holding a 40-year-old 'baby' with hair on his back. It is weird, it is shocking, it's almost too much -- just like turning Jesus over to continue scourging him on his chest is shocking and almost too much, which is the exact moment when this appearance of the Devil and the baby takes place." Aramaic was the language used by Yeshua and other Jews. This appears frequently in the movie's sound track. Nobody speaks that language today. A language consultant was hired to attempt to reconstruct the spoken language as it may have sounded in ancient times. One dialect of Aramaic, called Syriac, is still spoken today by some Jews and Christians in the Middle East. There are an estimated 250,000 Chaldean and Assyrian Christians in the United States whose previous generations frequently spoke in Syriac. However the use of the language is gradually dying out. With the massive exodus of Christians from the Middle East in recent decades, emigrants often learn the language of their adopted country and no longer speak Syriac. "Street Latin" was the language used by the Roman occupying army. It also appears in the movie. Hebrew was the original spoken and written language of the ancient Israelites. It was an almost dead language by the first century CE. It rarely appears in the movie. English subtitles are shown. However, one of the most inflammatory sentences in the Bible, was spoken in Aramaic without subtitles. The sentence was one of the the two biblical verses which have probably been responsible for more deaths of innocent people than any other passages. Exodus 22:18, in some translations, calls for the execution of all "witches," although a more accurate translation of the original Hebrew would call for the extermination of "women who use spoken curses to injure or kill other people." This partially justified the extermination of tens of thousands of persons considered to be witches and other heretics during the late Middle Ages and early Renaissance. Matthew 27:25 states: "Then answered all the people, and said, His blood be on us, and on our children." (KJV). In this passage, the author of the Gospel of Matthew has the entire Jewish mob in front of Procurator Pontius Pilate's palace demanding Yeshua's crucifixion, and accepting full responsibility for the act. Further, they are recorded as accepting that their children would inherit their guilt. Historically, Christian churches had taught that the blame extended beyond the mob and their children to all Jews who were in Jerusalem at the time, and to all Jews in the world who were alive at the time, and to all of their descendents down through the centuries. This was one of the main theological beliefs used by the Church to justify centuries of oppression, mass murders and genocides of Jews. It was only in the 1960s that the Roman Catholic Church finally repudiated these teachings. On 1965-OCT-28, at the Second Vatican Council, the Vatican issued "Nostra Aetate," a "Declaration on the Relation of the Church to non-Christian Religions." 1 It says in part: "...neither all Jews indiscriminately at that time, nor all Jews today, can be charged with the crimes committed during his passion." After receiving criticism from some religious leaders who previewed an early version of the movie, Gibson decided to delete the English subtitles for this passage. However, the words are still heard in Aramaic. The movie is "R" rated because of the level of violence, blood and gore. The movie was released to theatres in the U.S. and Canada on 2004-MAR-11. The Passion cost about $30 million to produce and $15 million to advertise. Most U.S. movies don't even break even with the revenue from North American theatre ticket sales. They rely on subsequent DVD/video sales, and international box office sales. However, The Passion had already grossed $125.2 million during its first five days in movie theatres. Forbes estimates that the eventual gross revenue from theatre showings could reach $350 million in the U.S. and Canada, and another $300 million internationally. Icon Productions will probably receive about 40 to 50% of the gross revenue. Icon will probably also receive between 9 and 15% of the wholesale value of merchandise associated with The Passion. This includes mugs, and nail pendants. By Labor Day, 2004-SEP-6, the film earned $370 million in the U.S. and Canada and over $600 million worldwide. It had become the highest-grossing R-rated movie of all time, and the 8th highest grossing film of all time in the U.S.
On 2004-AUG-31, the film was released for general sale on video at a retail cost of $29.98 on DVD and $24.95 on VHS. However, most outlets seem to be offering discounts. 31% of American adults had seen the movie. This compared with 57% for "Finding Nemo," and 42% for "Bruce Almighty." 59% of those who had seen one or more movies during the previous two years that had caused them to reflect on their faith listed The Passion of the Christ as one of the movies. 67% found the movie excellent; 23% good; 7% average and 2% below average or terrible. 89% of Evangelical Christian rated the movie as excellent. So did 78% of other Protestants and 68% of Roman Catholics. 53% were born-again Christians. This is higher than their incidence nationally (38%). 4% were Atheists or Agnostics. This is much lower than their incidence nationally (12%). 16% felt that the movie affected their religious beliefs. 10% changed both their religious beliefs and practices in response to the viewing. Less than 0.1% made a profession of faith or accepted Jesus as their Lord and Savior as a result of viewing the film. Melissa and Sean Davidson in Statesboro GA started to argue with each other as they left the movie. They debated whether God the Father in the Holy Trinity is human or symbolic. Melissa allegedly pulled out a pair of scissors, stabbed Sean's hand, and ripped off his shirt. Sean allegedly injured Melissa's arm and face. Both reported each other to the police; both were charged with battery. A married woman in her 40's in New Britain, CT, drove her car into a pond at city park in order to baptize herself. A man in his early 20's in Somerset County, VT, built a cross in his living room and nailed one of his hands in place. He then realized that he had a problem: he was unable to nail his other hand to the board. He called 911 for assistance. It is not clear whether he wanted the emergency response crew to nail his other hand in place, or to release his original hand. The movie was released for retail sales on 2004-AUG-31. Nominal prices were $29.98 U.S. for the DVD version and $24.96 for VHS. Many stores were offering significant discounts. Unlike most DVDs, there are "no frills, no bonus coverage, no director's commentary, no behind-the-scenes stories or interviews -- virtually no DVD extras whatsoever, other than the option of Spanish subtitles." 12 A special version including some of these features may be made available at a later date. Shortly before the film was released, Religion News Service (RNS) interviewed Rabbi Marvin Hier, founder of the Simon Wiesenthal Center and the Museum of Tolerance. He said: "If you're asking me if we have changed our positions, absolutely not." Hier said he still feels the film depicts Jews "in a very negative manner." Abraham Foxman, national director of the Anti-Defamation League (ADL) who lodged such strong protests earlier in 2004 before its theater release, told the RNS there's nothing more to say on the topic because "DVD is not the event the film was." 20th Century Fox reported that, during its first week of sales, nearly 9 million copies were sold: some in DVD format, and others in VHS. The Toronto Star reported this with the heading: "Jesus, that's a whole lot of DVDs." At its 2005-MAR annual convention, the National Religious Broadcasters (NRB) honored Mel Gibson with its Board of Directors Award for his work on "The Passion of the Christ" movie. The Award "honors a Christian who demonstrates integrity, displays creativity and makes a significant impact on society." The NRB is an association of religious broadcasters which limits its membership to Fundamentalist and other Evangelical Christians. David Germain, "Audiences want Easter with Passion," Associated Press, 2004-APR-11.